India ranks first in milk production in the world. Government of India plans to increase the milk production at the rate of 23% per year. The various cost effective and practically feasible strategies which can be implemented for increasing milk production in India are given in this post. In India, where the population is largely vegetarian, dairy is a primary source of protein. Milk-based paneer, ghee, yogurt and sauces are all staples of daily life, making the country both the largest consumer and the largest producer of dairy in the world. But a combination of low genetic potential, poor nutrition management and lack of veterinary support in India’s dairy cows is keeping the nation’s milk yields significantly below global standards. The milk yield and fat percentage is based on genetic potential of a buffalo or a cow. You cannot increase the milk yield beyond it’s genetic potential. But most dairy farmers in India, do not even get the actual potential milk yield from their dairy animals. The primary reason for this malnutrition as well as the dairy cattle are put into various stress factors. So, the easiest way to increase the milk yield to address the nutritional requirements as well as address the stress factors. Provide 20 to 25 kgs of green fodder. Don’t just provide only one variety of green fodder – try to mix legumes such as hedge lucerne, cow pea along with regular fodder such as C04, Sorghum, etc. Chaff the green fodder – this will increase the nutritional intake as well as reduce wastage. Provide 10 kgs of dry fodder. It is advised to provide dry fodder after evening milking. Provide 4 kgs of concentrate feed – increase this quantity for high milkers. Don’t use just 1 variety of dhana – try to mix 1 oil cake such as cotton seed cake, groundnut cake or whatever locally available, 1 grain as maize powder and 1 husk such as black gram husk, paddy husk, etc. Soaking this overnight will ferment the feed and increase the nutritional intake. Provide 50 grams mineral mixture – this is very important. If you do not provide provide mineral mixture it will result in micro-nutrient deficiency which will decrease milk yield as well cause reproductive issues. Provide 30 liters of hygienic/clean water. Wash the animals twice a day. Make sure the dung is cleared thrice a day. Make sure the animals are not beaten or threatened. Make sure there no mosquitoes in the shed. Always milk at the same time and by the same person. If the milker takes too long to milk the entire milk, then also milk yield will reduce. Make sure to deworm the animals regularly. Worms in the stomach will drastically reduce milk yield. Do not tie animals in direct sunlight. Allowing the animal to freely graze for at least few hours will increase the metabolism and also the animal will be happy – a happy animal produces more milk. Basically, address all needs of a cow or a buffalo. When you do that, the cow or buffalo will give maximum milk that it can produce as well as milk fat and SNF will also increase. Cows must calve to produce milk and the lactation cycle is the period between one calving and the next. The cycle is split into four phases, the early, mid and late lactation (each of about 120 days, or d) and the dry period (which should last as long as 65 d). In an ideal world, cows calve every 12 months. A number of changes occur in cows as they progress through different stages of lactation. As well as variations in milk production, there are changes in feed intake and body condition, and stage of pregnancy. Figure 1 presents the interrelationships between feed intake, milk yield and live weight for a Friesian cow with a 14 month inter-calving interval, hence a 360 d lactation. 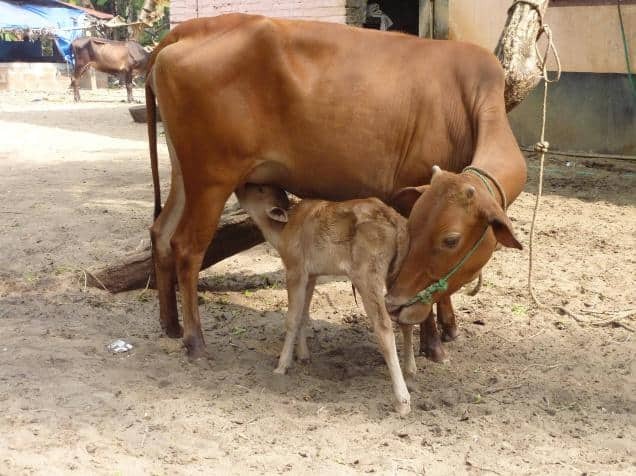 Following calving, a cow may start producing 10 kg/d of milk, rise to a peak of 20 kg/d by about 7 weeks into lactation then gradually fall to 5 kg/d by the end of lactation. Although her maintenance requirements will not vary, she will need more dietary energy and protein as milk production increases then less when production declines. However to regain body condition in late lactation, she will require additional energy. Cows usually use their own body condition for about 12 weeks after calving, to provide energy in addition to that consumed. The energy released is used to produce milk, allowing them to achieve higher peak production than would be possible from their diet alone. To do this, cows must have sufficient body condition available to lose, and therefore they must have put it on late in the previous lactation or during the dry period. Milk yield at the peak of lactation sets up the potential milk production for the year; one extra kg per day at the peak can produce an extra 200 kg/cow over the entire lactation. There are a number of obstacles to feeding the herd well in early lactation to maximise the peak. The foremost of these is voluntary food intake. At calving, appetite is only about 50 to 70 per cent of the maximum at peak intake. This is because during the dry period, the growing calf takes up space, reducing rumen volume and the density and size of rumen papillae is reduced. After calving, it takes time for the rumen to “stretch” and the papillae to regrow. It is not until weeks 10-12 that appetite reaches its full potential. Following peak lactation, cows’ appetites gradually increase until they can consume all the nutrients required for production, provided the diet is of high quality. From Figure 1, cows tend to maintain weight during this stage of their lactation. Although energy required for milk production is less demanding during this period because milk production is declining, energy is still important because of pregnancy and the need to build up body condition as an energy reserve for the next lactation. It is generally more efficient to improve the condition of the herd in late lactation rather than in the dry period. Maintaining (or increasing) body condition during the dry period is the key to ensuring cows have adequate body reserves for early lactation. If cows calve with adequate body reserves, they can cycle within two or three months after calving. If cows calve in poor condition, milk production suffers in early lactation because body reserves are not available to contribute energy. In fact, dietary energy can be channeled towards weight gain rather being made available from the desired weight loss. For this reason, high feeding levels in early lactation cannot make up for poor body condition at calving. The two major factors determining total lactation yield are peak lactation and the rate of decline from this peak. In temperate dairy systems, total milk yield for 300 day lactation can be estimated by multiplying peak yield by 200. Hence a cow peaking at 20 litres per day (L/d) should produce 4000 L/lactation, while a peak of 30 L/d equates to a 6000 L full lactation milk yield. This is based on a rate of decline of 7 to 8 per cent per month from peak yield, that is every month the cow produces, on average, 7 to 8 per cent of peak yield less than in the previous month. This level of persistency is the target for well managed, pasture-based herds in temperate regions. Actual values can vary from 3 to 4 per cent per month in fully fed, lot fed cows to 12 per cent or more per month in very poorly fed cows, for example during a severe dry season following a good wet season in the tropics. Generally speaking, the higher the milk yield at peak, the lower its persistency in percentage terms. Underfeeding of cows immediately post-calving reduces peak yield but also has adverse effects on persistency and fertility. Dairy cows have been bred to utilise body reserves for additional milk production, but high rates of live weight loss will delay the onset of oestrus. Underfeeding of high genetic merit cows in early lactation is one of the biggest nutritionally induced problems facing many small holder farmers in the humid tropics, because they often do not have the necessary improvements in feeding systems to utilise high genetic potential. If imported high genetic quality cows are not well fed, milk production is compromised, but of more importance, they will not cycle until many months post-calving. To maximize profitability, milk production needs to be efficient. Milk quality, safety and sustainability must also be factored in. The rumen is the major digestive organ in ruminants. Its rich and complex ecosystem, allowing for fiber digestion, can be highly sensitive to nutrient-concentrated diets, leading to disorders. Managing the rumen includes balancing the gut microflora for optimal fermentation and dietary efficiency. It is important to avoid excess rumen digestions as not to waste unnecessary nutrients on the microbes, and to minimize unwanted gases such as methane and ammonia. This can also lead to nitrogen and energy losses and has environmental consequences. The nutritionists strive to improve feed efficiency to reduce the costs of production. Due to the genetic selection and the increase of the dairy performances, the optimization of the ruminant fermentations is a key factor of the feed efficiency. Ensures vitamin storage and redistribution to the tissues. Furthermore, the liver supports the processes of degradation and detoxification, as well as the transformation of a large number of endogenous and exogenous substances. With the improvement of their productivity, dairy cows are confronted, mainly in early lactation, with changes in their metabolism. A too early or too intense mobilization of their adipose reserves intensively stimulates hepatic metabolism which can induce liver steatosis or ketosis. The consequences are: decreased appetite, degradation of gluconeogenesis, a decrease in the immune response and an increase in oxidative stress. Finally, any alteration of the immunity will cause an exacerbation of the infectious phenomena (metritis, mastitis), but also metabolic with direct impacts on the health of the animals and their reproductive performances. Adequate rearing, control of feeding and adapted feed transitions can prevent the occurrence of these diseases and increase the longevity and production capacity of ruminants.